Today’s diverse information systems require multiple identities, directories and points of access. These ”islands of identity” may cause inefficiencies, security risks and compliance violations. To ensure your systems remain secure and available, you need to SIMPLIFY your environment by consolidating identities and directories. 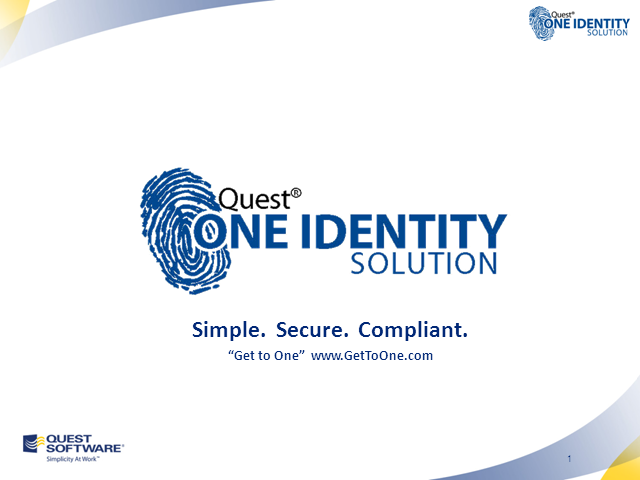 The webcasts in this channel will explore how the Quest One Identity Solution helps you easily overcome the challenges of managing heterogeneous environments by helping you “get to one” – one identity, directory and point of access, as well as protecting your systems from unauthorized access or changes. Successful identity and access management means different things to different organizations, but in almost every case, it requires complex, time-consuming, and expensive solutions. However, an ever-growing number of organizations have found a new way to achieve their identity and access management objectives simply, inexpensively, and powerfully. In this webcast, Jonathan Sander, Identity and Security Analyst and David Lundell, Practice Director, Identity & Secure Access Management, will discuss how organizations like yours have discovered and are implementing a simplified approach to identity and access management. You may think that identity and access management is complex, expensive, and nearly impossible. Think again – things have changed. During this informative discussion, Jonathan Sander, identity and security specialist at Quest Software, will explore how many organizations have used the “get to one” approach to achieve their identity and access management goals while reducing costs, improving security, and achieving compliance. Identity and access management does not have to be complex and expensive. In this presentation, Jackson Shaw, identity and access management industry visionary, presents a simplified approach to identity and access management that actually reduces complexity, streamlines operations, and increases security and compliance while building on existing investments.